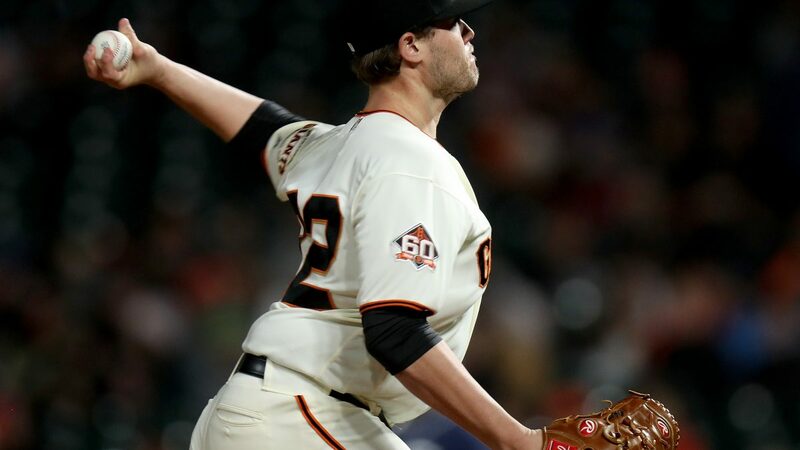 Chris Stratton didn’t have the proverbial mic drop most starters aim for in their last start of the season, lasting 4-2/3, allowing three runs (only two earned) on six hits, and walking a season-high five batters. 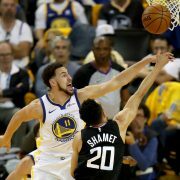 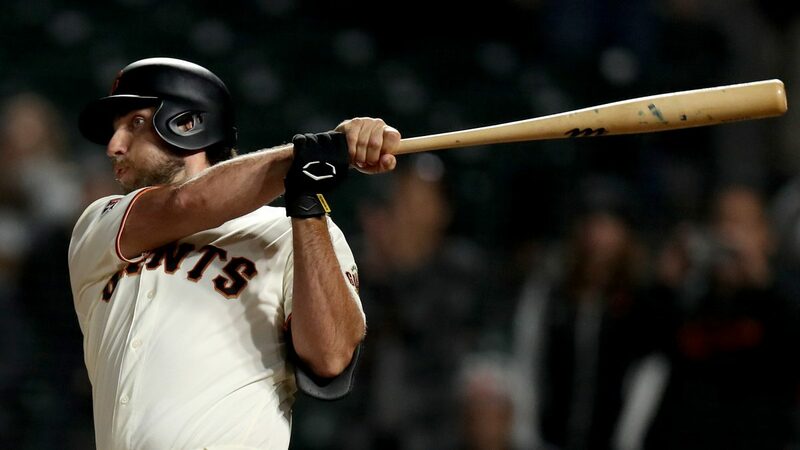 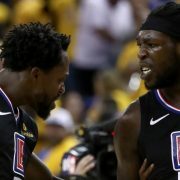 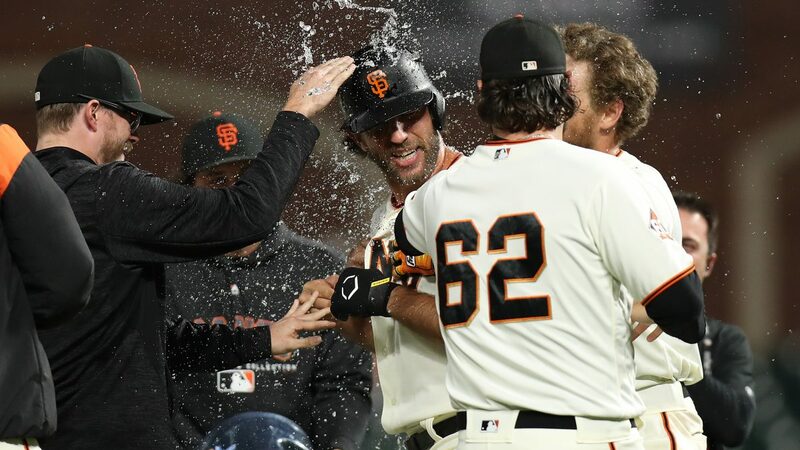 But he kept San Francisco in the game, and in the end it was another starter— Madison Bumgarner — who dropped the mic Tuesday night with a walkoff single in the bottom of the twelfth to snap the Giants (73-85) five-game losing streak with a 5-4 victory over the Padres (63-95). 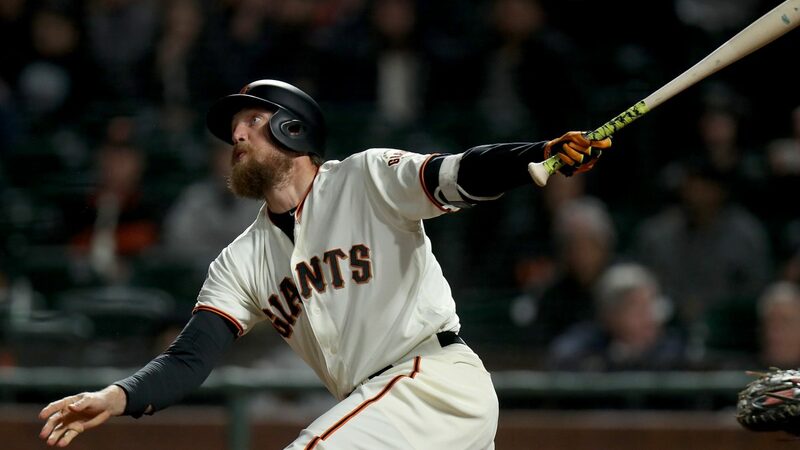 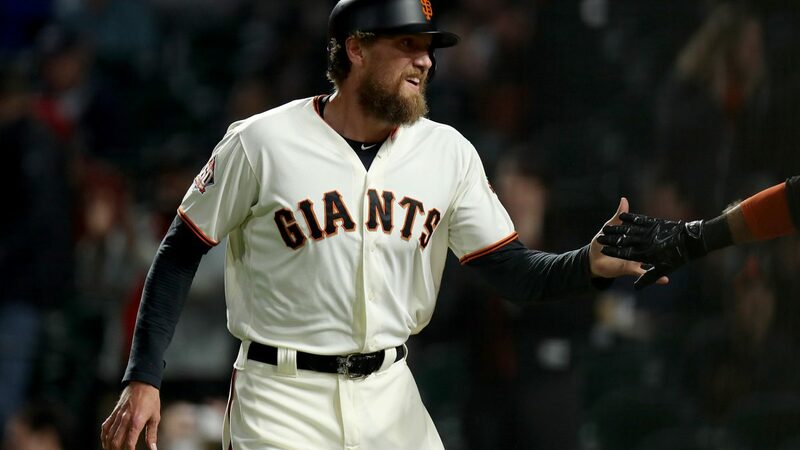 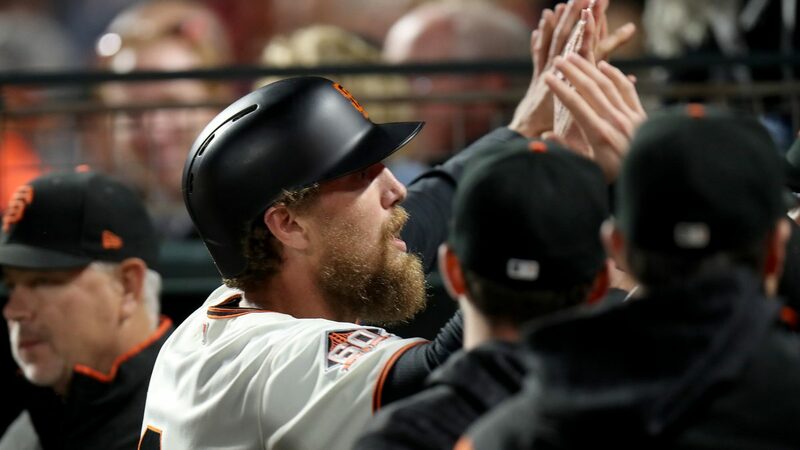 A pair of Forever Giants — Hunter Pence and Gregor Blanco — also left their marks as they continued to make the most of what is likely the last week either will spend in a Giants uniform, knocking in three runs between them. 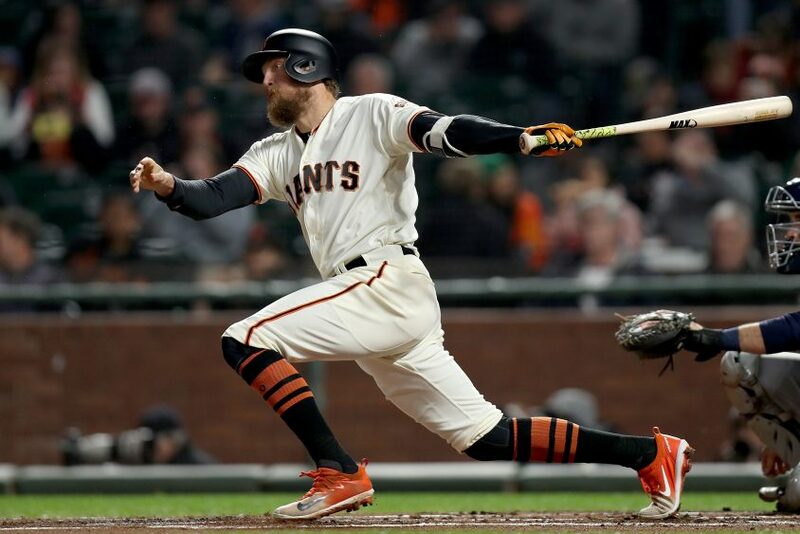 San Francisco Giants right fielder Hunter Pence (8) reaches on an error in the first inning as the San Diego Padres face the San Francisco Giants at AT&T Park in San Francisco, Calif., on Tuesday, September 25, 2018. 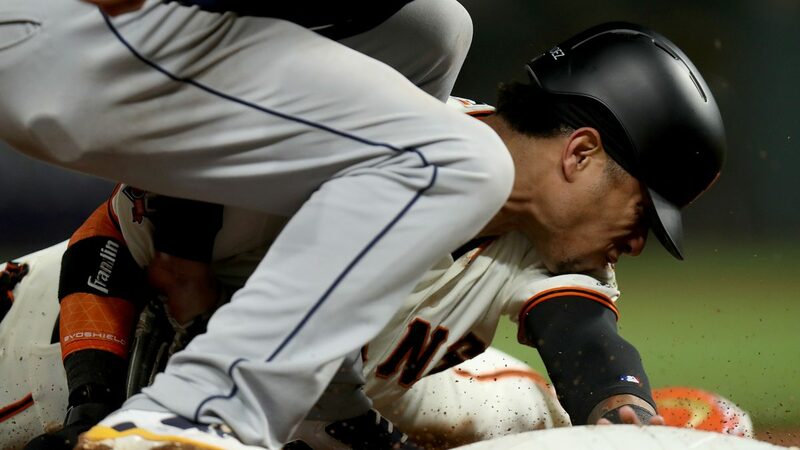 After facing the wrong end of a shutout against the Padres Monday night in their fifth-straight defeat, the Giants had hopes of a rebound when they got on the board in the first inning for the first time since September 9. 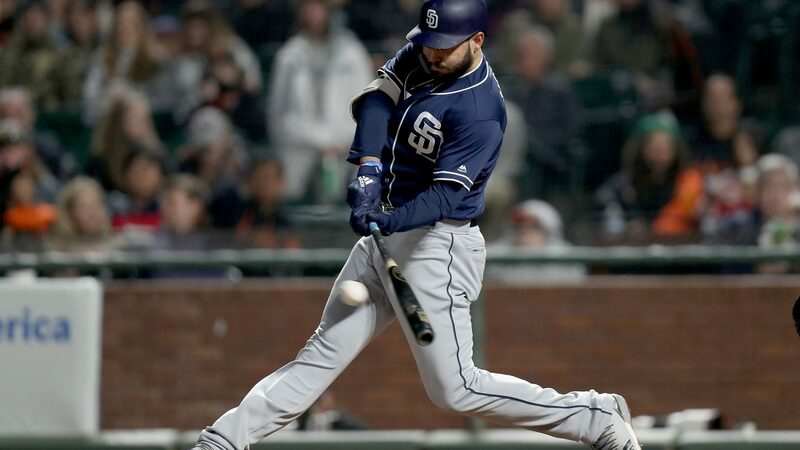 In an almost comic display of one of their season’s fatal flaws — their inability to hit with runners in scoring position — the run came after Pence reached first on an error from Friars shortstop Javy Guerra (the first of two he would commit) and Evan Longoria roped a double down the left field line. 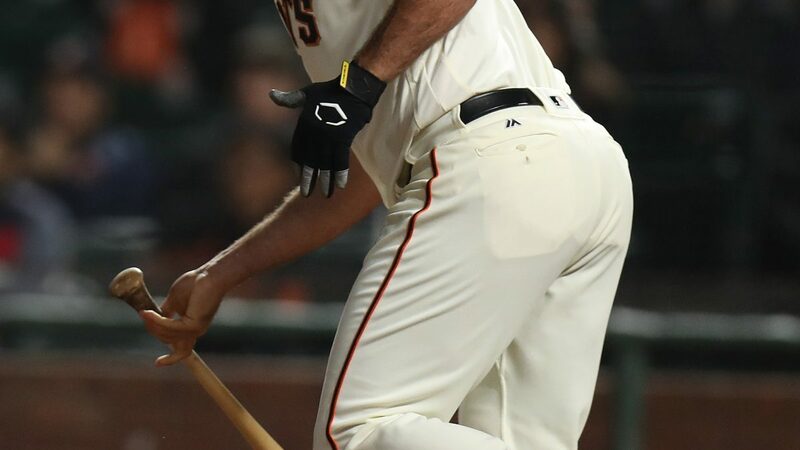 San Francisco would have fruitless opportunities with runners in scoring position in both the second and fourth innings, and coming into Tuesday, they had just seven hits in their last 43 at-bats with runners in scoring position. 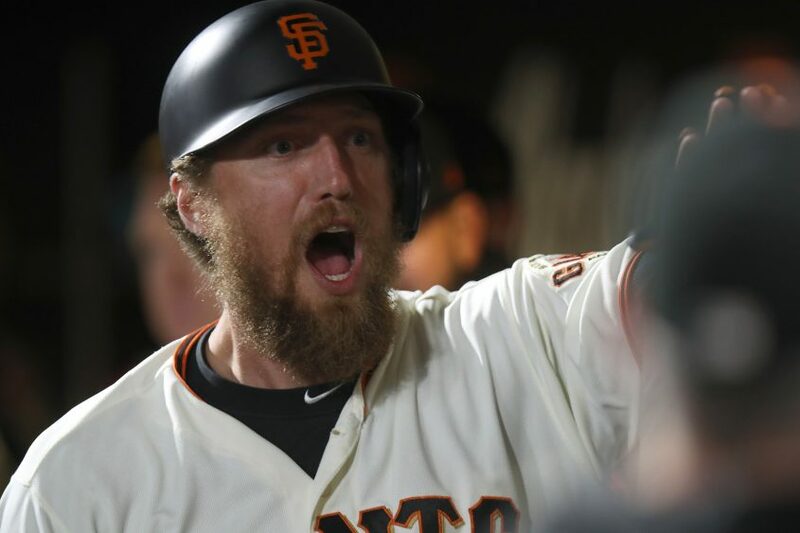 San Francisco Giants right fielder Hunter Pence (8) reacts after a solo home run in the fifth inning as the San Diego Padres face the San Francisco Giants at AT&T Park in San Francisco, Calif., on Tuesday, September 25, 2018. 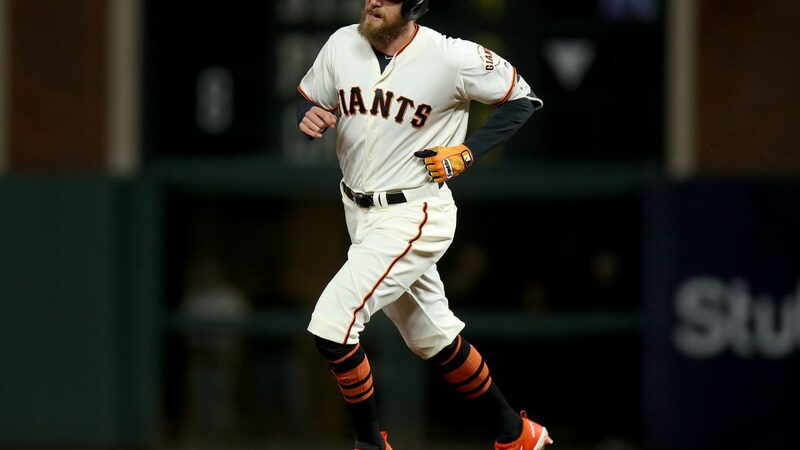 Following the theme, their second run came on Pence a solo shot (4) into the bleachers in left-center field in the fifth, his second in September. 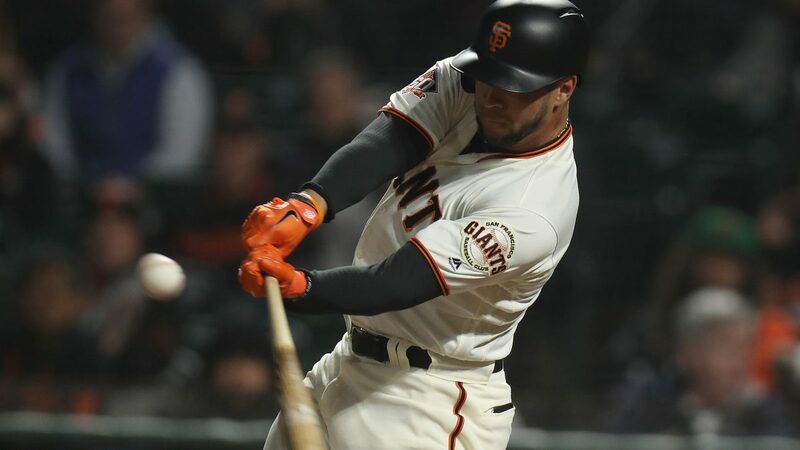 Meanwhile, Stratton (ND, 10-10, 4.85 ERA) suffered costly errors from rookie Abiatal Avelino, in his first start at second base, and Gorkys Hernández in center field, which contributed to a high pitch count for Stratton. 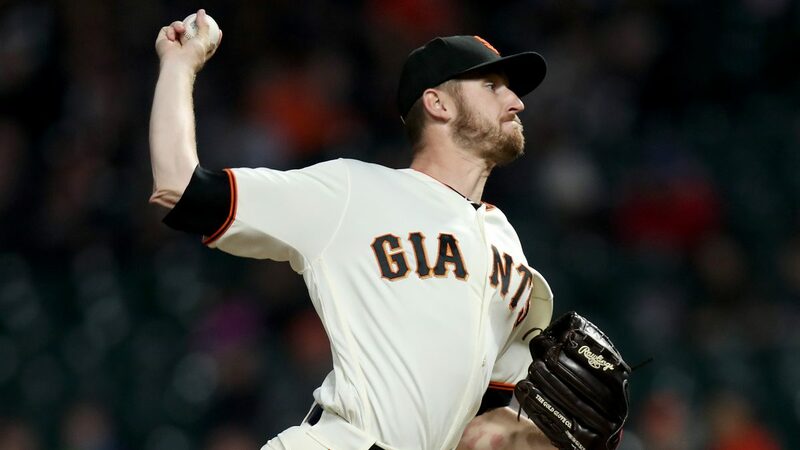 The Padres scratched across a pair of runs (one unearned) in the fourth, so with two out in the fifth and the Giants down 3-1, Stratton was pulled at 102 pitches. 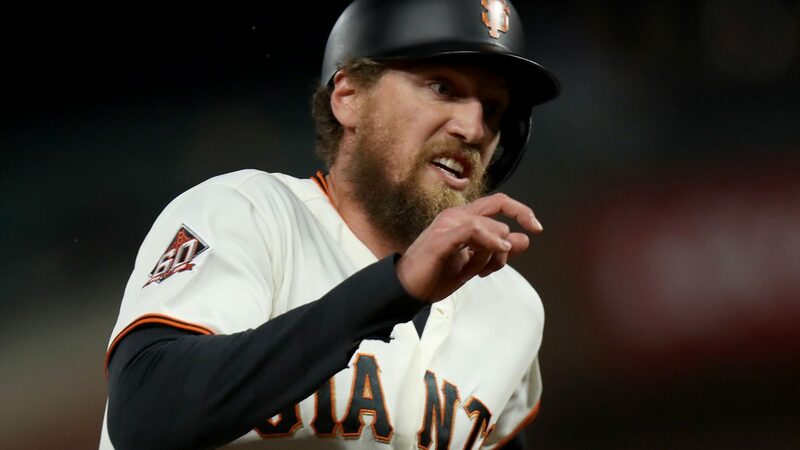 And just as it was beginning to look like another lost cause in an increasingly dismal season, the Giants snapped out of their RISP-phobia. 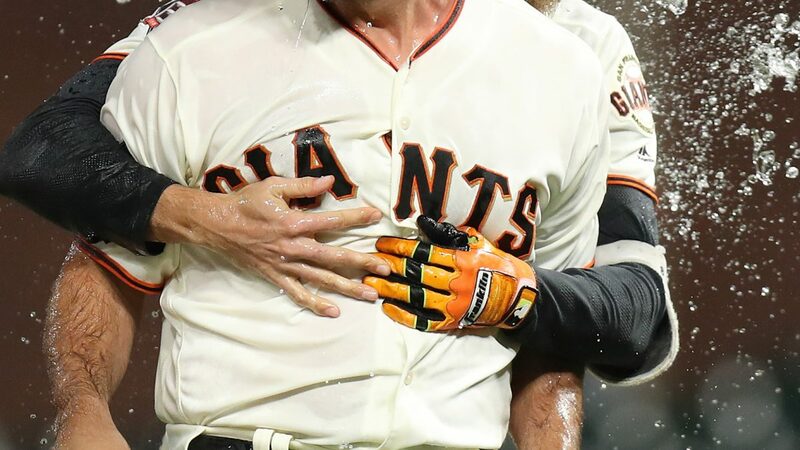 Joe Panik pinch-hit with two outs in the seventh and knocked a single to left to bring up Pence, and the veteran rose to the occasion. 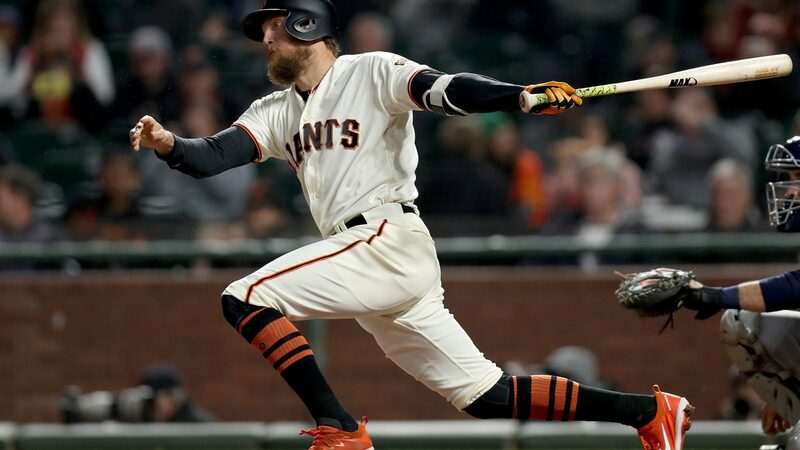 San Francisco Giants right fielder Hunter Pence (8) scores in the first inning as the San Diego Padres face the San Francisco Giants at AT&T Park in San Francisco, Calif., on Tuesday, September 25, 2018. 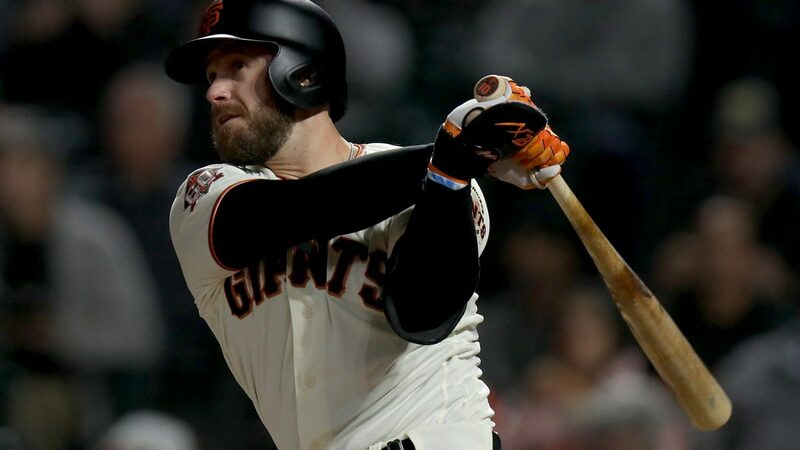 Despite being edged out of right field with the Giants offseason acquisition of Andrew McCutchen, Pence has maintained a positive attitude this season. 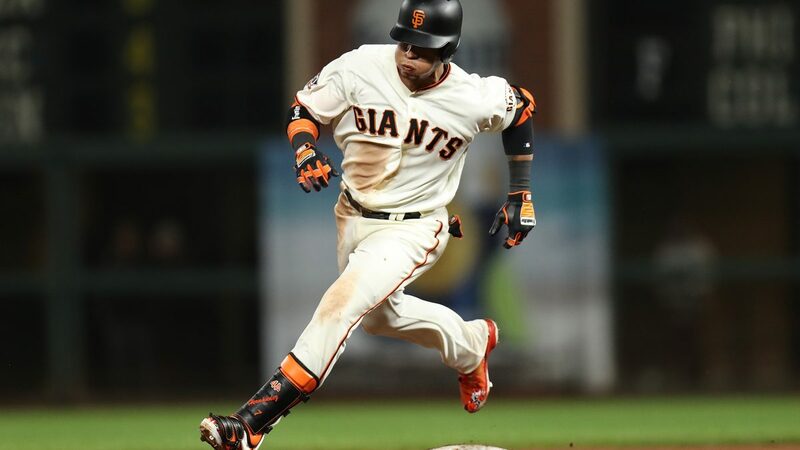 He transitioned to left field without complaint and embraced a role that saw him spend more time than not on the bench for much of the season. 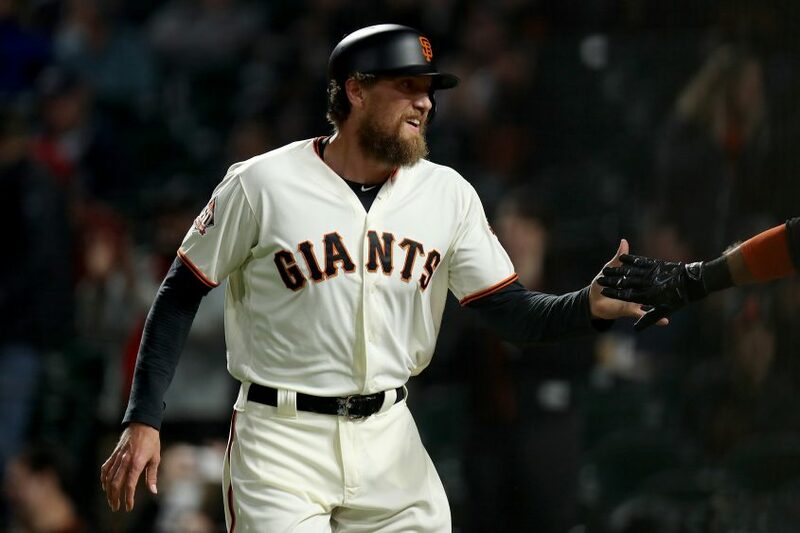 With Pence’s contract up after the season, and with a performance decline coinciding with aging into his mid-30s, it’s no secret that his tenure in San Francisco is likely up. But with the vacuum created by McCutchen’s trade to the Yankees, the Giants have allowed him to split time with Chris Shaw at his former position out in right field, and he’s made the most of ten starts so far in September. 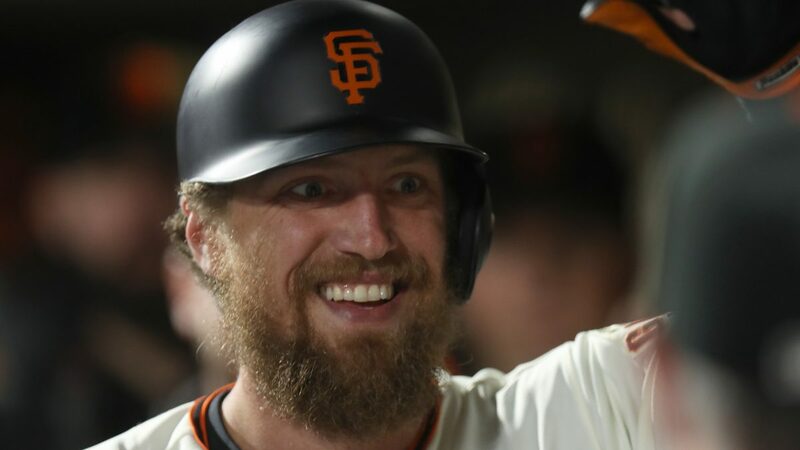 Tuesday in the seventh he kept the line moving with a single up the middle to move Panik over and bring up Blanco, a fellow beloved Giant. 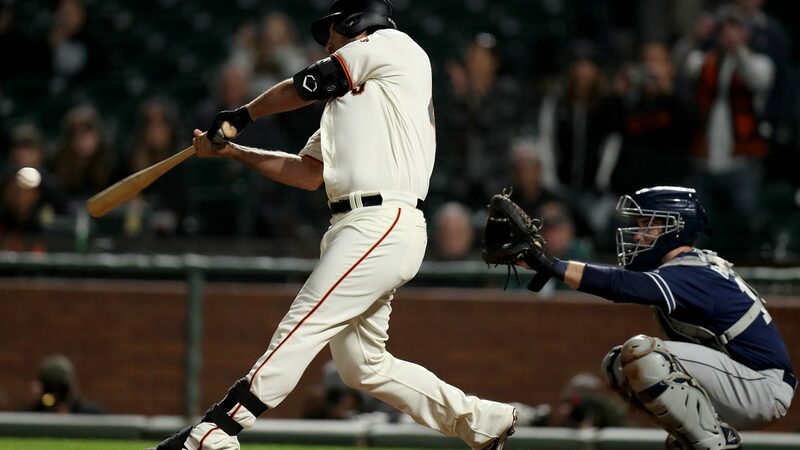 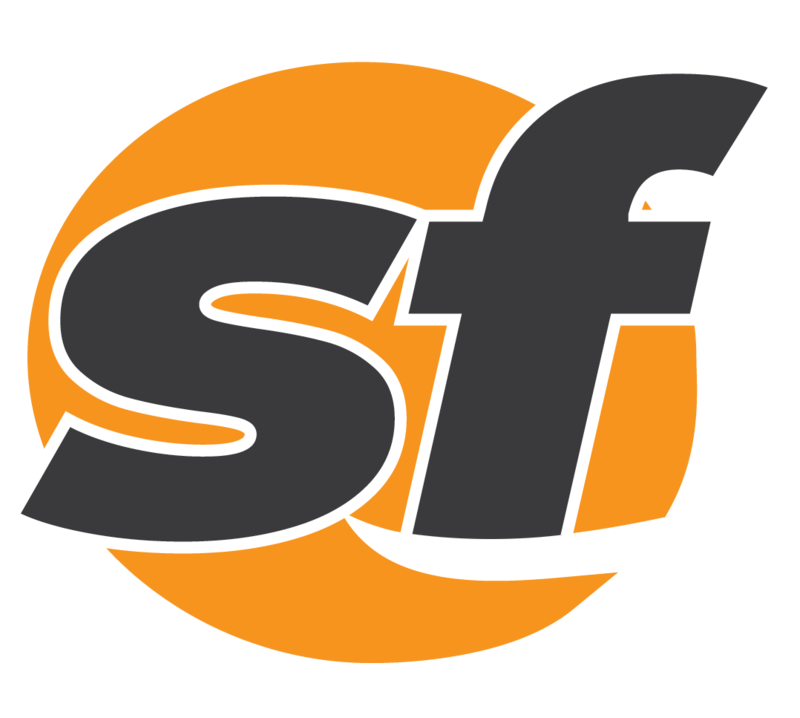 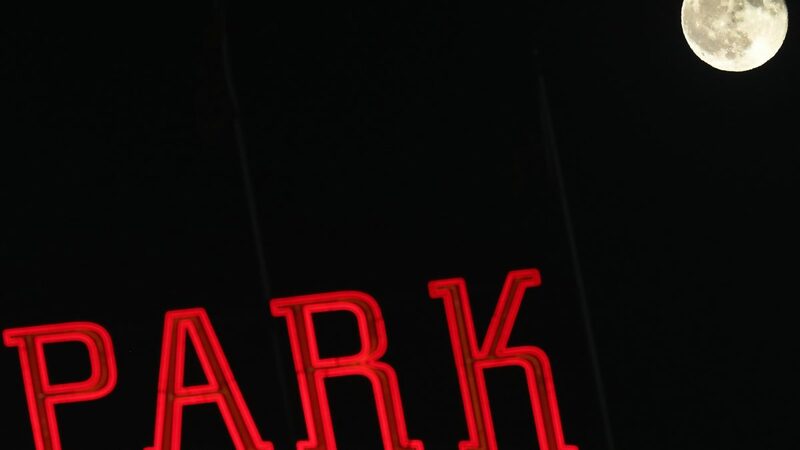 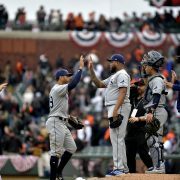 Blanco took an 0-1, 99-mph two-seamer from right-handed rookie Robert Stock and shot it to left to clear the bases and give the Giants the 4-3 lead. 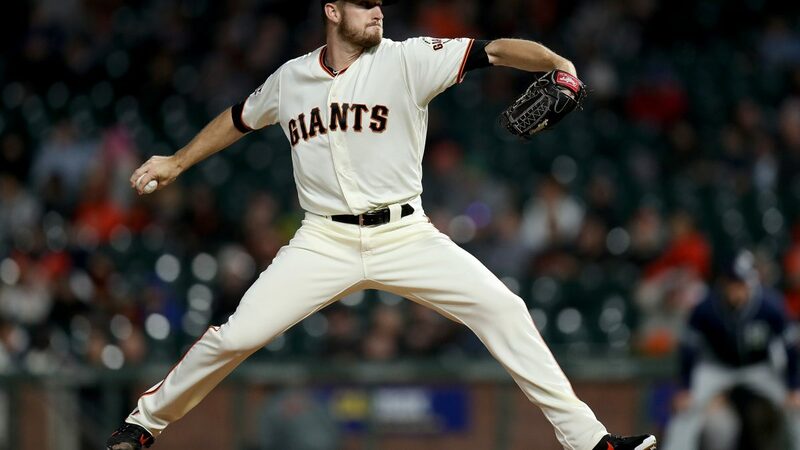 But the Giants Biofreeze Pitcher of the Month Will Smith (BS, 14 S, 1.90 ERA) forced extra innings allowing a run in the ninth, and with the Giants out of position players off the bench, it fell to Bumgarner to untie the knot as he came up to bat in the bottom of the twelfth following a leadoff triple from Hernández. 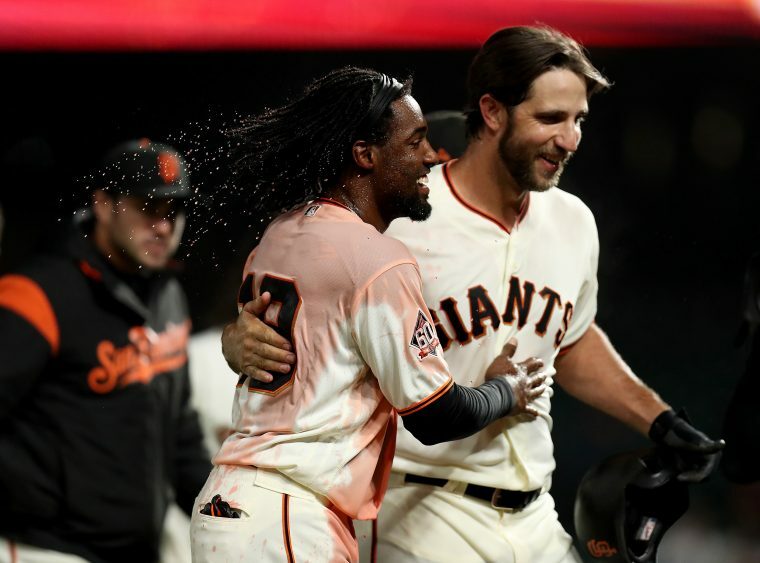 San Francisco Giants starting pitcher Madison Bumgarner (40) connects for a walk off single scoring center fielder Gorkys Hernández (7) in the 12th inning for a 5-4 victory over the San Diego Padres at AT&T Park in San Francisco, Calif., on Tuesday, September 25, 2018. 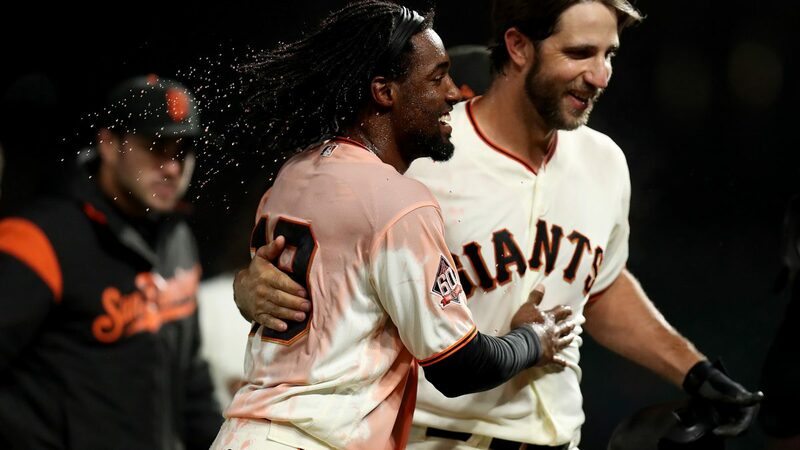 San Francisco Giants second baseman Alen Hanson (19) celebrates a Madison Bumgarner walk off single scoring center fielder Gorkys Hernández (7) in the 12th inning for a 5-4 victory over the San Diego Padres at AT&T Park in San Francisco, Calif., on Tuesday, September 25, 2018. 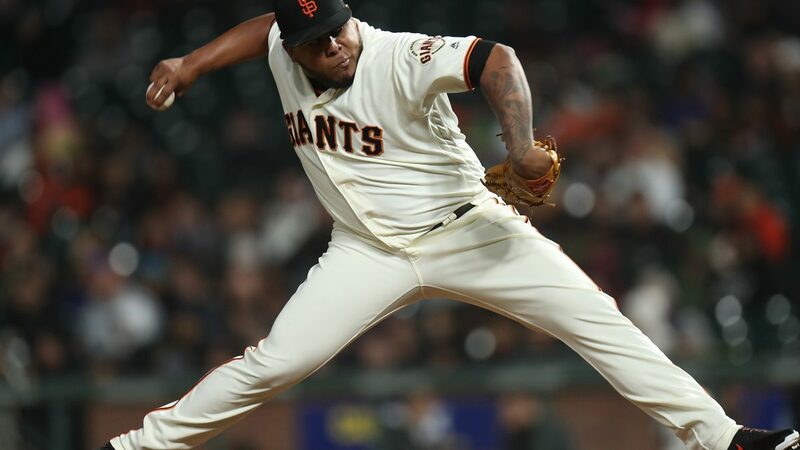 With preceding scoreless 11th and 12th innings, Mark Melancon (W, 1-3 , 3.08 ERA) took the win in the extended match, handing Rowan Wick (L, 0-1, 7.36 ERA) the loss. 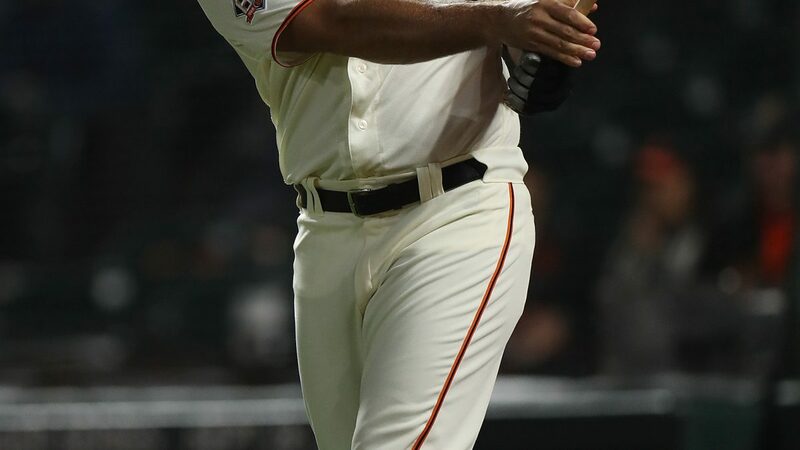 Casey Kelly (0-2, 2.89 ERA) will make his third start in a Giants uniform in Wednesday’s season series finale against the Padres. 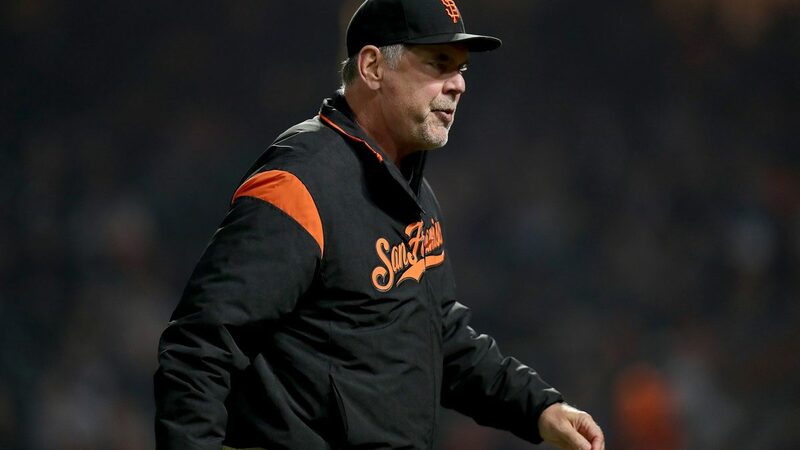 In his two previous starts Kelly allowed just one run against the Reds and two against the Mets, but the Giants were shutout in both matches. 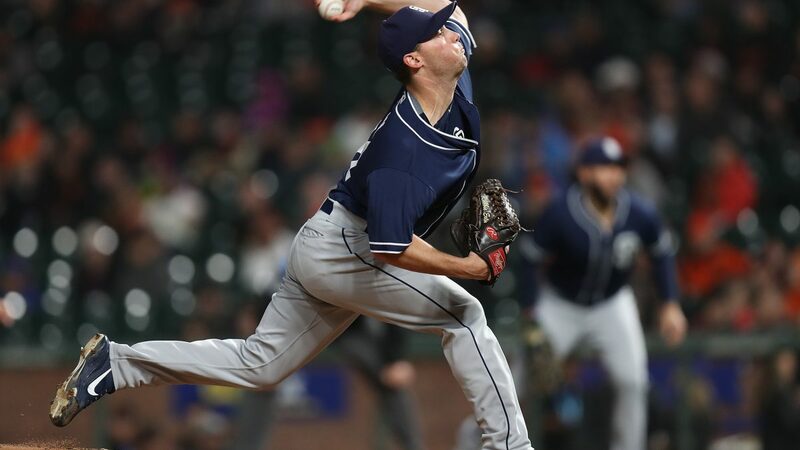 He will face lefty Eric Lauer (6-7, 4.60) in the 7:15 p.m. contest. 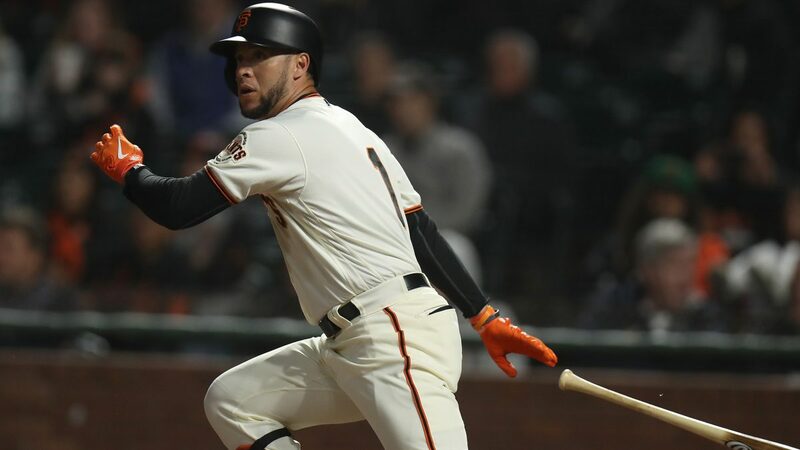 The Dodgers currently have just a one-game edge on the Rockies in the race for the west after they lost to the Diamondbacks Tuesday and Colorado defeated the Phillies. 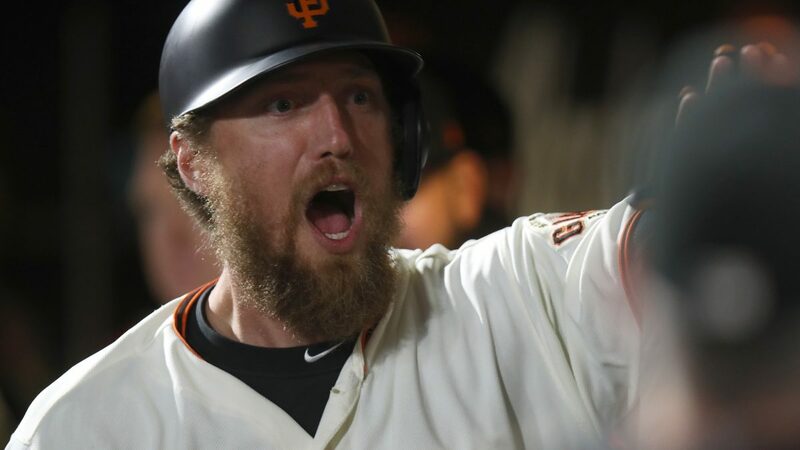 LA will finish their series with the Diamondbacks (80-78) Wednesday, while Colorado closes out a series with a comparable opponent in the Phillies (78-79). 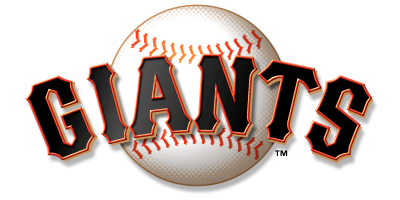 The Rox will take on another .500-ish team when they face the Nationals (80-78) at home this weekend as the Dodgers come to San Francisco. 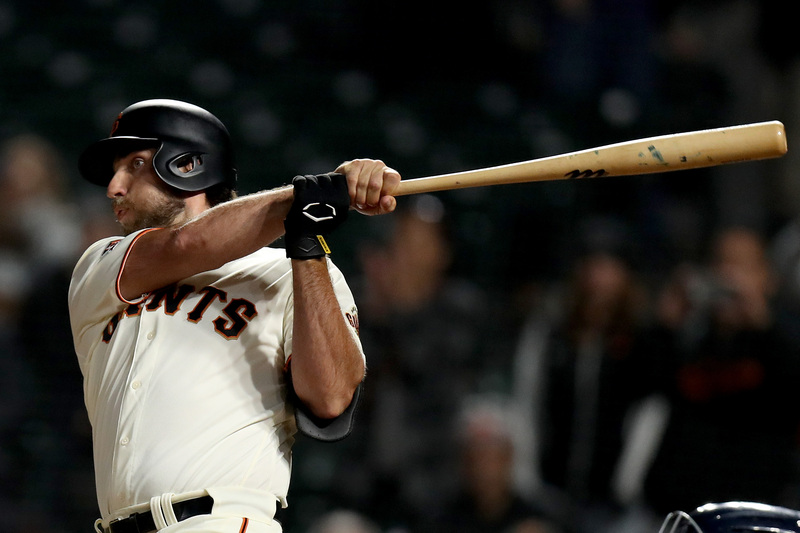 … The Giants have pushed Madison Bumgarner‘s start back a game so that he will make his final appearance of 2018 against the Dodgers Friday in an effort to throw a wrench in Los Angeles’ October plans. 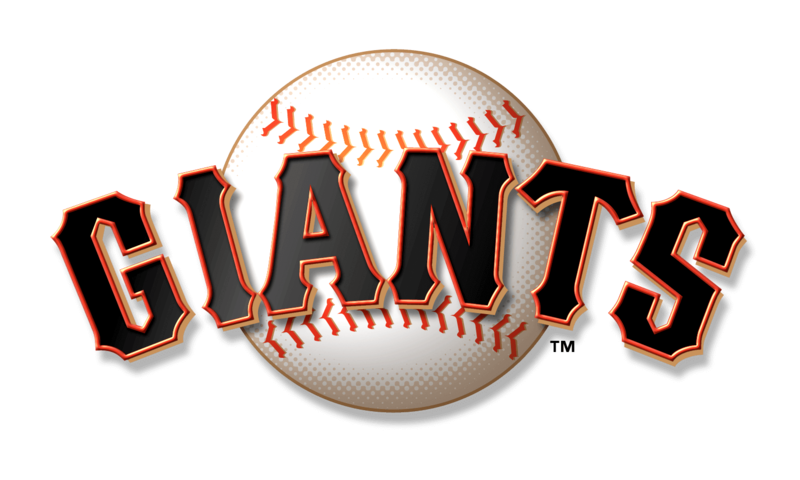 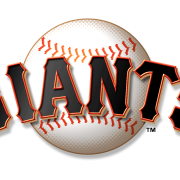 While on paper the Giants appear an easier mark than the Nats, they have played the Dodgers hard this season and go into the series with a 9-7 record against LA.